IT MIGHT not be on the field, but this new grandstand is a keeper. The new addition to the spectators' area on field one at Martens Oval replaces the old grandstand that had been at the premises for some 70 years. 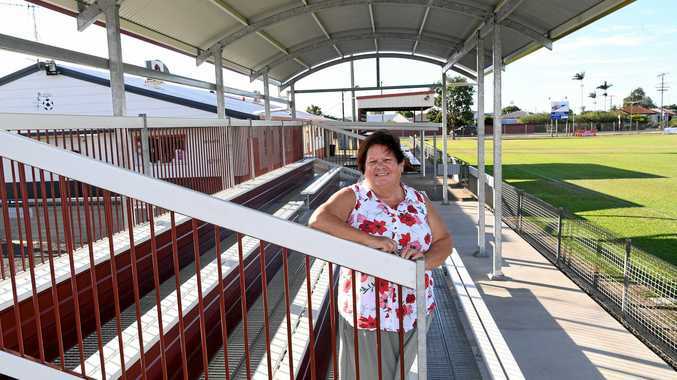 Football Bundaberg president Femia Eizema said the new stand got a good workout over the weekend with the new season kicking off with a bang. "The season started on Saturday and we had the Wide Bay Buccaneers there on Sunday so it was completely full all weekend,” Ms Eizema said. "Everyone is saying how lovely it looks. It's definitely more modern. The upgrade was made affordable thanks to state funding of some $140,000. Ms Eizema said while the former grandstand had stood for a long time, she expected even more this time. "It's made out of steel, not wood, and steel lasts much longer,” she said. The new media tower between the dugouts is also larger. The facility is now looking forward to the arrival of two other covered grandstands from separate funding. One will be placed on field two and the other on the junior fields.